Kosovar university students have strong opinions on the current situation and future of their nation. Their opinions regarding negotiations between the Serbian and Kosovar governments are vital, particularly because soon they will be the ones to inherit the legacy of these talks. This project not only looks into these opinions, but also the perceptions these students have towards peace within their country and the road ahead. Some see hope; others see a lost cause. By interviewing six participants what was unearthed was disappointment, doubt, power, and determination. 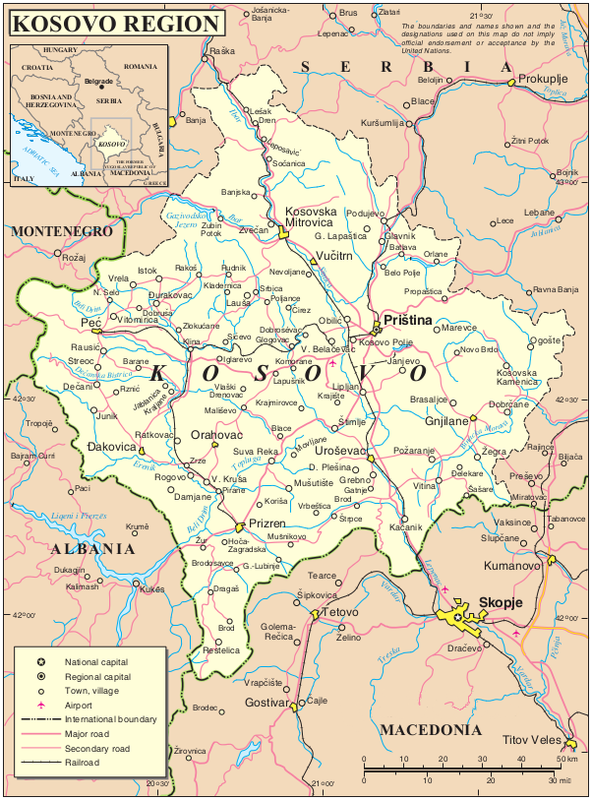 Although the country discussed is often referred to as Kosovo, this paper uses the name Kosova to describe the location. This is the Albanian interpretation of the name, and is being used in the paper because those interviewed are of Albanian ancestry. Although use of Kosova is not accepted everywhere, it is used here to reflect the words and thoughts of those interviewed. Here, Kosovars are those who live in the defined boundaries of the country. Albanians refers to those who live in Kosova but have heritage connected to those in Albanian and speak Albanian every day. Serbs refers to those who have heritage connected with Serbia and speak Serbian every day, they often reside in the northern portion of the country. Serbian is an adjective used to represent someone or something which belongs to the country of Serbia. The history of Kosova in today’s world too often becomes minimalized to the end of the 20th century. During this time, the country was engulfed in war. At the heart of these feuds were battles of identity and territory (Lederach, 1997). Serbia, headed by Slobodan Milosevic, claimed the right to Kosova using history as their defendant and police force as their weapon. Before NATO intervened, the main protectors of Kosova were civilians who used arms to defend their people (Kosova Liberation Army), sometimes using the same brutal force as their enemies. Post-NATO involvement, a vacuum existed, thus creating a state of paralysis. Change finally occurred in 2008 when the country of Kosova formally declared independence. With this new country came a new government, which many claim is run only by those former members of the KLA, who have no prior political experience (Hysa, 2011). Still, to this day, many have vivid flashbacks of their struggle, which in turn is making tension relief all the more difficult. Although both Serbians and Kosovars have scars, efforts have been made for progress, and the main advocate for change has been the European Union. Using rewards and punishments specified for both countries, the EU was able to bring Kosova and Serbian officials to the same table for conversation. These mandated talks have been used as a way of “governing the normalization of relations” (BIRN, 2014, p. 12). Titled the Brussels Agreement, because of the location in which they occur, their aim is to repair relations and create better opportunities specifically for the citizens of Kosova. Although there has been progress, specifically involving trade, university diplomas, and boarder control, citizens of Kosova still harbor resentment (Malazogu and Bieber, 2012). Some claim that the conversations have not entirely repaired relations, but contribute to an escalation of volatile emotions. On a larger scale, both governments feel the other is stalling development for their country. For Serbia, this development would translate into EU candidacy, whereas for Kosova this development would translate into status recognition (BIRN, 2014). On the other hand, the European Union mediators believe these dialogues are creating peace and stabilization both within the countries and within the region as a whole (Fridman, 2015). Their job is to merely bring both parties to the table, and after doing so they can claim progress. However, this disconnect is only mounting. For the most part, citizens of both countries are unaware of the reality these talks hold and their opinions are deemed unnecessary. Balkan Insight (2015) declares that “most available documents do not explain the full details on how the agreements are to be implemented” (p. 13). If the documents themselves are not fully decipherable for those in politics, the citizens have an even more difficult time. Many find it hard to have an opinion on the talks because they are simply unaware of the results. There is a disconnect between the two countries, between the countries and the EU, and most importantly between the state governments and their citizens. Citizens are completely unsure of the goal of the discussions, which stems largely in part because there is a lack of clarification. So far, no one has given a direct definition for the talks. They are not considered peace talks, or conflict transformation, making the goal even more inconspicuous. This then could lead, and has led to a lack of success. At times, the use of “agreement” infers ambivalence regarding peace as a realistic, obtainable goal. Inadequacy of transparency end up leaving the country of Kosova in a state of “frozen conflict” (Fridman, 2015, p. 176), by which no transformation in the name of peace seems to be taking place. Within the same context, the topic of peacebuilding seems to be generally avoiding between the two countries, which makes the future even more uncertain. The atmosphere and environment these talks are creating is one of mistrust and indifference. Media and politicians are giving many mixed signals which are often being directed towards the young, some of which are interested in politics, some of which just want to study. Prishtina, the capital of the newly formed country, is a thriving city which houses a large university (University of Prishtina) that educates roughly 40,000 students1. They span many subjects and come from across the country to learn. Even though these individuals were children during the war, they still lived through conflict. They have a different understanding of conflict transformation and peacebuilding due to their location of residence. These college students have not only lived through struggles but through triumphs: the independence of their country. The future of this country is unknown, but many say that the progress or lack of progress will come from the hands of these 18 to 24 year olds. They will be the ones to determine whether or not the future will be a “spiral of peace and development” or “a spiral of violence and destruction” (Lederach, 1997, p. 17). Much attention is drawn to people of this age group, particularly because 44.4% of the entire population remains under the age of 24 years old2 (CIA World Factbook, 2014).They were children when most of the violence occurred, and yet they will be the ones to live with the consequences. For these reasons, it is important to see through their eyes and give a platform for their voice. In such a young population, a population which helps define the country, how do they perceive the Brussels Agreement between Pristina and Belgrade and what are their perceptions regarding the future of their country? Do they believe that the current talks and processes are making a positive difference? How do Kosovar university students define peace? Do these individuals believe in the reality of a conflict-free future? This project will hopefully bring answers to these questions and further make clear the intentions of these upcoming leaders. The study focused specifically on the thoughts and feelings of individuals in Prishtina, Kosova, with the participants being those who are currently enrolled in a university in Prishtina. The intention was to receive a well-rounded view of one single generation and the limitation of age also allowed for a reduction of overgeneralization. The participants' ages ranged from 19 to 23, and although they might not have been in the war themselves, they have been growing up with the effects of the conflict. Because the memories of the war will not be as salient for these individuals I instead focus my attention on how they understand their country currently and what their thoughts on the future are. Along with asking for their opinions, I also ask them how they believe other university students feel. This allows my research to not only focus on how they view their state, but also how they view their peers. In total, there were six participants in the study which were evenly distributed between those who consider themselves women and those who consider themselves men. The format was semi-structured; however, a list of questions was used as a guideline. All of the interviews were conducted in English, which is a second or third language for all of the participants, but which they were all conversationally proficient in. Each of the participants will remain anonymous so as to respect their privacy, and will be identified based on a number. The research I have conducted sheds light on the thoughts and values of the participants, however it will be inevitable that my thoughts and values seep into this study as well. Although I allow the participants space to express their thoughts freely, it is important to note that I will never be able to truly empathize with them due to the fact that I am an outsider. During the time these interviews took place there were large disputes over the Brussels agreement and active talks going on with Serbia3. This also plays a role in the responses of the participants, and continues to change the attitudes of those living not only in Prishtina but throughout the whole country. As a researcher currently attending university, I became interested in those who were the same age as me. Naturally I was drawn to this group because I might relate with them more easily. Similarly, these participants might be more inclined to answer questions and be honest from someone who is of their own age. It is important to understand the opinions of the younger generations all over the world, but these young adults in Kosova continue to have more importance based on their mass. This generation will be the one to either preserve or desert their country and will impact future actions. 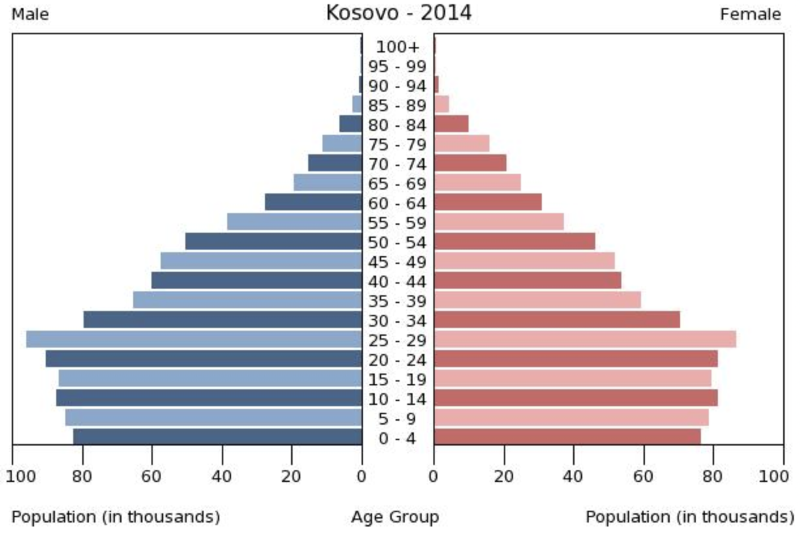 Many academics and politicians often refer to this demographic enigma when talking about Kosova, but few focus on the attitudes and perspectives of this age group. These academics and politicians also focus on the negotiations between Serbia and Kosovo, but lack the input of this age group, all together making me want to study them more. Most of my questions posed to these participants include discussion of peace and conflict because this is the focus of my undergraduate study. This impacted the choice behind the questions and topics which will be discussed. However, none of the participants were studying the same field nor do they work for a political organization. I intend to accurately portray their thoughts and feelings on the present times and future possibilities of their country. There is much literature about the creation of a new Kosovar state, the Brussels Agreement, and peacebuilding in general. However, it is difficult to find research which combines all, and it is even more difficult to find research focusing on the future. Predictions can be made and have been made, but are primarily focused on the economic accountability of the country and the future impacts of this. For example, Adbullai and Brovina (2015) state “Many young people are educated but have difficulties finding jobs, this should be provided by the state and institutions of Kosovo in order not to have "export" of youth in Europe, because that would be disastrous and failure for the state of Kosovo” (p. 143). Although this is integral to creating a thriving country, these authors talk specifically about policy instead of perception. It is impossible to study the future, but it seems that academics have forgotten to look into perceptions and opinions of the future. However, by using literature such as this, one can understand the state in which the youth are living in, which would then adjust their opinions given in this study. The current political and social environment in Kosova is still one which relies heavily on the international community. For example, the “EU has taken over many of the responsibilities of the UN and NATO in peacekeeping and police, state-building and administrative reform,” (Adbullai and Brovina, 2015, p.140) since independence and continue to have a strong presence. Students living in Prishtina my see this as assistance but they may also feel that it simply shows the weakness within the country. The same is also occurring with the outside enforced agreements. Instead of instilling conversations among different levels, The Brussels Agreement remains behind closed doors without transparency and only seen by a limited number of high power officials (BIRN, 2014). The secrecy has created skepticism among everyday citizens who will be most impacted by these agreements. In recent polling done by the National Democratic Institute (NDI), 48% of Kosovar Albanians support the dialogue occurring between Belgrade and Prishtina, while 47% oppose it (2014)4. This divided understanding and support for the conversations show the disconnect occurring between the politicians and the citizens. This agreement has been cited as a breakthrough for both normalization and relief of tension between “former long-time enemies” (BIRN, 2014, p.12), and yet these effects are not having an impact on everyday lives. This anger and distrust leads some to believe that the true motivation continues to be European Union membership which then forms shallow promises. Instead of moving forward, these seem to be keeping Kosova still. Just as the Brussels Agreement is given much attention, there is also emphasis on peace building theory. Many wonder if the country will fall back into conflict in the future, and claim that a stable government needs to be created for this purpose. Others say that for peacebuilding to create a lasting impact it must be “a complex and multilevel process involving a diversity of actors, a wide range of essential professional expertise, and a multiplicity of civil society actors” (Ramsbotham, Woodhouse, and Miall, 2011, p. 240). This proves that a collection of actors needs to occur in order to improve the lives of citizens. According in John Paul Lederach’s (1997) research, the true purpose of building peace in divided societies is to instill movement. By this, he means that “the goal is not stasis, but rather the generation of continuous, dynamic, self-regenerating processes that maintain form over time and are able to adapt to environmental change” (p. 84). In his opinion, peace would adapt to the people living and changing in an area. Both of these highlight the proper way to ensure that there will not be reliving of the past. The reality of the situation shows uncertainty among both Albanians and Serbs, which leads to a lack of transformation and continued fears about the other. This atmosphere might cause change but it might also cause a reversion to hostilities of the past. Some claim that progress needs to occur from changes in social norms, however there is research which also proves that“when memories of conflict are fresh and vivid, mere contact and repeated interactions between individuals may not be sufficient for social norms to evolve” (Mironova and Whitt, 2015, p. 5). All of these opinions prove different insight into the proper way to create a new, accepting environment. In this case it would be an environment which would allow people to remember the past, but also move on from it. Participant One was not the only individual to feel disappointed with the Brussels agreement. However, unlike most participants he was able to live in both Germany and the United States for a year respectively during his adult life. At the age of 23, he has been able to experience life in a different culture, however he intends to live his life in Kosova. Unfortunately, the majority of other participants were unable to have this same experience, which affects the results of their answers. Upon being interviewed Participant One expressed his dissatisfaction with these negotiations stating that they are only helping Serbia. To him it makes “Serbia look good only in the eyes of Europe,” (Participant One, personal communication, 18 November 2015) although they may not be following through on promises. In his opinion, Serbia should have taken responsibility for the crimes they committed, before these negotiations can ensue. Until this occurs, he prefers the Kosovar government to focus on education, claiming it will “lead to having better prospects” (Participant One, personal communication, 18 November 2015) for the entire population. Participant Five also stated that the current talks are only helping the Serbs, but by this she meant the Serb minority currently living in the boundaries of Kosova. For her the conversations are “bad for us, good for Serbian people here” (Participant Five, personal communication, 1 December 2015). By us she is referring to the Albanian majority living in Kosova. However, she was unable to give a clear answer when asked if the Brussels Agreement was helping or hindering progress in the country. Her response was poignant, saying she has “no thoughts” on the topic because she and the entire population are unaware about what is being agreed upon. This is not a singular feeling, but one which is shared by many other citizens. Because of this, predictions have come true as popular backing for these talks has continued to erode which has made it almost impossible to continue any sort of discussion (Malazogu and Bieber, 2012). Among the six participants interviewed, four expressed that the current negotiations going on between Serbia and Kosova are hindering the progress of their country. According to Participant Three, the talks are keeping Kosova from being recognized as a country by all countries around the world. To her the current protests and use of violent force5 in the street and in parliament “is just a reaction to what these talks have brought” (Participant Three, personal communication, 25 November 2015). In her mind, the main issue is the lack of clarity, and politicians and officials not asking citizens what they want. Participant Four, who studies psychology while also working at the news network Balkan Insight, supports open communication because “you can’t just keep going forever hating your neighbor” (Participant Four, personal communication, 27 November 2015) but also notes that a large masses of people are clearly upset which is manifested in protests. The acknowledgement of civil unrest also became manifested in their feelings about the results of the negotiations. Mediators of these talks continue to comment on the progress and acceptance they have created. Some claim that it has been the most successful act of cooperation and mediation to happen between the countries of Serbia and Kosova; this may be accurate, but some citizens still do not see a change in their lives and they are concerned about the environment the talks are creating. All but one participant responded negatively when asked if the negotiations were creating a more peaceful Kosova. Both Participants One and Four said they are having the opposite effect, fueling hatred and division in the country, and “dividing the country’s population by ethnicity rather than helping to bring people together” (Participant One, personal communication, 18 November 2015). Balkan Insight (2015) highlights these theories by stating the dialogue has now created so much division within Kosovo that many people are worried whether or not it is worth it, concerned that internal divisions within Kosovo are being created as kind of ‘collateral damage’ from the dialogue. (p. 8) This is partly due to the emphasis placed on the Serbs in the northern municipalities of Kosova. Much of the negotiations revolves around giving the Kosovar government autonomy over this area; instead it has opened a door leading to Serbs wanting to remain part of Serbia (Todoric and Malazogu, 2011). Where acceptance has failed, hatred continues. Some say that the talks have failed entirely, and citizens should be allowed to create peace for themselves. For example, Participant Two notes that peace will not come from the government or high officials but from non-high ranking citizens (personal communication, 25 November 2015). Talking and making these agreements in Brussels will not create a lasting calm in the country, the only way to ensure this is to have everyday interactions with the other and to allow time for people to heal. Participant Three also shares the sentiment surrounding civil society. She believes that progression and empowerment of the population would have happened naturally, and that the discussions have done more harm than good to aid this change (Participant Three, personal communication, 25 November 2015). Many are unsure as to the intention behind these acts, but some still believe the thought is commendable. Abdullai, Jonuz, and Ngadhnjim Brovina. 2015. Peace-building and state-building challenges in the republic of kosovo.Revista de Stiinte Politice(47): 135-145, http://search.proquest.com/docview/1721941827?accountid=11243 (accessed December 6, 2015). Balkan Investigative Reporting Network. (2014). Big Deal: Civic Oversight of the Kosovo - Serbia Agreement Implementation. Pristina: BIRN. Balkan Investigative Reporting Network (2015). Big Deal Split Asunder: Civic Oversight of the Kosovo - Serbia Agreement Implementation. Prishtina. BIRN. Fridman, O. (2015). Unstructured Daily Encounters: Serbs in Kosovo after the 2008 Declaration of Independence. Contemporary Southeastern Europe, 2(1), 173-190. doi:3 November 2015. The Government of the Republic of Kosova. Brussels Agreements Implementation State of Play. (2015). doi:3 November 2015. Janjic, D., & Hysa, Y. (Eds.). (2011). Kosovo: Independence, Status, Perspectives: Adjusting Regional Policies of Ethnicity and Borders. Ravenna: Longo Editor. Kasic, B. (Ed.). (1997). Women and the Politics of Peace: Contributions to Culture of Women's Resistance. Zagreb: Centre for Women's Studies. Lederach, J. P. (1997).Building Peace: Sustainable Reconciliation in Divided Societies(pp. 3-61, 73-85).Washington, DC: United States Institute of Peace Press. Luci, N., & Gusia, L. (2015). “Our men will not have amnesia”: Civic Engagement, Emancipation, and Transformations of the Gendered Public in Kosovo. Civic and Uncivic Values in Kosovo (pp. 199-220). Budapest: Central European University Press. Mironova, V., & Whitt, S. (2015). International Peacekeeping and Positive Peace: Evidence from Kosovo. Journal of Conflict Resolution, 1-31. Retrieved December 1, 2015, from http://jcr.sagepub.com.proxygw.wrlc.org/content/early/2015/09/15/0022002715604886.full.pdf html. National Democratic Institute. “Kosovar Attitudes on the 2013 Brussels Agreement between Kosovo and Serbia February 2014 Public Opinion Research.” (2014, February 1). Retrieved November 1, 2015. Nesovic, B., & Celeghini, R. (2015). Community/Association of Serbian Municipalities: The Sum of All Fears. Ramsbotham, O., Miall, H., & Woodhouse, T. (2011). Contemporary conflict resolution: The prevention, management and transformation of deadly conflicts. Cambridge, UK: Polity. Chapter 9 (Peacebuilding). Richmond, O. (2011). A Post-Liberal Peace. New York, New York: Routledge. Simic, O., Volcic, Z., & Philpot, C. (Eds.). (2012). Peace Psychology in the Balkans: Dealing with a Violent Past while Building Peace. New York, New York: Springer. Todoric, V., & Malazogu, L. (2011). Belgrade-Prishtina Dialogue: Transformation of Self-Interest Required. Kosova's opposition party, Vetevendosje, has used eggs and tear gas to stop Parliamentary sessions leading some high power members to be arrested. There have also been mass protests which resulted in violent clashes between protesters and riot police. “Several MPs have been arrested for setting off tear gas in parliament and there have been clashes between opposition supporters and riot police in Pristina. They are demanding that the Pristina government scrap its recent EU-mediated agreement with Belgrade to set up an Association of Serbian Municipalities, which they say will give Kosova Serbs too much power.” (BIRN). Sources: CIA World Factbook (above). National Democratic Institute (below). Rachael A. Pulwers graduated in 2017 with a Bachelors degree in Peace Studies from George Washington University in Washington, DC.